The Spiralizer 5-Blade is our pick for the best spiralizer due to its assortment of 5 blades in the system. It can make perfect veggie noodles and can accommodate all diet plans. It comes with a recipe book and is made with Japanese stainless steel cutting blades. Our step-up pick is the Brieftons 5-Blade and it is also made with 420-grade Japanese stainless steel blades and is BPA free with its ABS material housing. It comes with 5 labels for you to choose for your specific type of veggie slice or noodles and it has a blade storage as well. 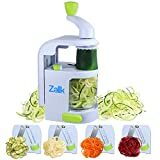 The budget pick is the Zalik 4-in-1 Slicer and it can be used for many years to come due to its durable BPA-free material housing and quality blades. It is a great budget option for those who want to make homemade pasta with the use of veggie noodles. Zoodles or zucchini noodles have been a thing lately for the health conscious. If your diet consists of carb rich foods and want to introduce a new way of eating noodles to your diet, zoodles are a great starter for most people. Veggies are a great alternative to your diet, and it can get boring if you prepare vegetables like they are all the time - as chopped parts or as part of a meal. Therefore, adding a twist to veggies such as making these zoodles can definitely put some spice into your kitchen. These unique veggie noodles are made with a vegetable spiral slicer or a spiralizer. 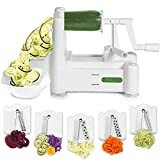 If you are looking for a food processing tool or kitchen utensil that can make zoodles, this is how you can make some at home. This processing tool take a few turns of the handle to make your food item. As a result, it can make your regular and boring old average vegetables into uniquely shaped noodles that will make your mouth water. It can be nearly any solid veggie that can be turned into noodles that can work well with this kind of unique and innovative kitchen tool. Aside from making zoodles, they can also be used for making food garnish. These spiral making machines can make garnishes that you can use to decorate food with. Garnishing is an important part of food prep in general. Whether it is at home with the guests or especially out in a restaurant or family business where you need to be presentable with your food, garnishing is a crucial thing to think about. Consider getting garnishing tools in your kitchen such as this one to make the experience much better when it comes down to food preparation. They make it easier for parents to get their kids acquainted with veggies. Kids are known to be picky eaters, so seeing colorful pasta can make them interested with tasting it. This is why choosing your recipes carefully is important and experimentation is the key to get your children to eat their greens. One such example is letting them try out the taste of zucchini noodles for a change. It will be definitely a life changing event and your kids just might like veggies even more than before with the trusted help of a kitchen veggie spiral garnishing tool. One of the key benefits of this spiral slicer is that it can help add presentation for your food. The main reason that makes them popular is that they make you an instant wizard in the kitchen due to its endless designing possibilities with various attachments. The creativity of any person can be expressed through his or her cooking, and so this is why you need to consider this unique way of food preparation. Attachments: The ease of attachments for this spiral noodle maker can make it easier to set up in the long run. This ensures that you can simply use any attachment that you like whenever and wherever, for any food type or recipe that you wish, without as much breaking a sweat to do it. Ease of maintenance: Maintaining your kitchen spiral tool should be a breeze overall. Its parts should be easy enough to disassemble and clean and most parts should go easily right into the dishwasher without sacrificing its quality and performance as a kitchen tool for making vegetable noodles and possibly other types of garnishes depending on the number of attachments and your recipe needs. Safety features: The safety features such as stability as well as a suction bottom can make it much easier to handle for beginners. Nobody wants to get injured while they are using a food prep tool and this is why it is crucial to have a kitchen tool that will adhere to all of your safety standards and needs when it comes down to food handling. Number of blades: The number of blades can also matter when it comes down to processing your food items, making it easier for you to chop or make garnishes out of your vegetables. In addition to that, the speed can be enhanced with much more blades as well as it can add more power in terms of processing, especially for stubborn and brittle or thick vegetables or food items. Ease of setup: Setting up the spiral machine can be troublesome for most people, that’s why it should come with a ready to read user’s manual that has clear and concise instructions for you to know about, so as to know where to place this part and that part. Quality of the body or housing: The housing durability is also important so that all of the internal parts and the moving mechanisms will be just fine when it comes down to any food prep or operation in the kitchen. Remember that the housing does the same important job as your other parts - to keep them all together, working and functioning well. Foods you can process: The food types that you can process in the machine can vary per model, but it is usually any veggie that can be spiralized, such as zucchini and carrots. Most can take nearly all food types and strengths but some are only meant for regular foods due the lack of blade strength and number. You should know what foods you will often process with the kitchen tool before you go on ahead and buy one. As our top pick, the Spiralizer 5-Blade is your choice because of its 5-blade set that is made Japanese stainless steel for cutting ease. It can be easily cleaned by submerging it underwater and it is also quite easy to secure the veggie into position without hurting your fingers at all. If you want to experience healthy eating then this is a good option for you. 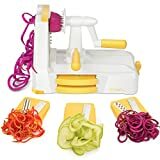 The only concern about the Spiralizer 5-Blade that is not a big deal is that it may not have more blades compared to higher priced ones (e.g. those with 7 blades). Our step-up pick, the Brieftons 5-Blade is also made with Japanese grade stainless steel and can make various cuts from 2 mm up to 5 mm and it also comes with labels for the blades for you to easily identify which is ideal for your veggie noodles. For our budget pick, we chose the Zalik 4-in-1 Slicer, which is made out of BPA free material and has a strong suction base so that it will not easily topple over. 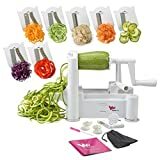 With the blades made of stainless steel, those who love fitness can definitely depend upon this noodle maker for their homemade veggie noodles. The Inspiralizer is a great choice for those who are just beginning to get into spiral machine noodle making options. It is BPA free and has a sleek design. It comes with counter clamps for stability and it is backed by a 1 year warranty. The WonderVeg comes with a julienne attachment for making other veggie recipes. It comes with a small recipe book for your reference and it is easy to use with its quality 420 grade stainless steel. It is not flimsy at all when you are using it. The Hamilton Beach 70930 is a good option if you want an electric powered type of kitchen spiral machine. It can make fresh veggies into noodles and you can also use it for making ribbons as well as linguine and spaghetti. You can also make veggie salads, apple tarts, curly French fries and others with its capacity of up to 6 cups. 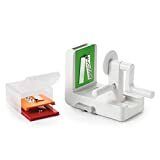 If you want an easy to clean spiral machine then you can go for the Zestkit Tri, which is ideal for most low carb diet plans and comes with 3 sets of blades for you to choose from. It can help spiral noodles from fruits and veggies without much effort and it can also shred some food items. It is backed by a 1 year warranty and it is also FDA approved. The OXO 3-Blade is a great go-to option if you want 3 blades for cutting your noodles or even making French fries out of your veggies or other food items. It comes with an easy to use rotating handle and a suction cup for making it much more stable to use while in any kitchen countertop or table. You can also use it to make your own salad items or even garnishes. 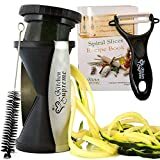 The Kitchen Supreme is a great choice for spiral spaghetti making from veggies and it can also be used for peeling off food items such as vegetables and making julienne spirals out of them. It comes with 2 julienne sizes as well as BPA free plastic for its housing and components. The Manifold Handheld is complete with many other freebies such as a cleaning brush, since it is handheld unit that is easy to carry anywhere and anytime. It is made with quality stainless steel blades that come in 4 options and it is ideal for those with a smaller kitchen or just want a more minimalistic style for their food prep item. There were other spiral making products that were not in this list because they lacked safety features, which are all important when making your veggie noodles. It is also important that they stay sturdy and steady as you use them in the kitchen. Q: What are the benefits of this kitchen tool? 1) Veggies help you detoxify due to its water content, such as with cucumbers and zucchini. Detoxification is important because every single day, we need to face having to take in various chemicals from the air and some in our food items. It is important to have an internal cleansing with the use of veggies and other healthy foods, so that we can stay healthier and live for much longer years to come. 2) You can put veggies in your diet and not even know or be aware about it. Vegetables are great additions to have a balanced diet and not everyone really likes the idea of putting veggies in their meals. If you have kids and they are picky eaters when it comes down to veggies then using this kind of tool can get them to eat veggies later on. 3) It can help with weight loss and a lower intake of calories, which can counteract fatty foods. Losing weight means giving up some fatty foods and replacing them with much better food items such as vegetables. You can substitute pasta with veggie noodles so that you will consume less sugars and it can help with your weight loss overall for a healthier diet and lifestyle. 4) You can boost your immune system due to the minerals and vitamins that are present with veggies. Vegetables are very much known to have vitamin C and other vitamins and minerals that are known to boost your immune system so that you do not get sick very often. This is very important for kids and for those times when the weather is really bad so you need something to get you healthy. 5) The nutritional value of your food won’t be destroyed because you aren’t overcooking it. This is an important factor when it comes down to food prep and especially with sensitive food items such as veggies. They can get soggy and this can result with their nutrients being lost. It is important that you keep the nutritional value of your food just right so that it will be helpful for your well-being to keep you healthy and strong against diseases. 6) You can combine different veggies for your preferences so you can make each meal much more interesting for everyone and have variations. This makes it much easier for you to prepare a dish or any kind of food for your guests. If you are trying to think of a good recipe for a party or for someone who is coming over, the veggie noodle is an easy to prepare food type if you have this kind of tool. 7) If your veggies tend to look flat, they will look fuller if you make them into veggie noodles. Compared to the flat looks of the veggies that will sit on your dinner table when they are cooked or even when they are raw or steamed, they will become much better in terms of presentation and appearance and will make your mouth water if you set them on the dinner table as veggie noodles and intrigue your family members/guests. 8) You will find this tool very easy to prepare with if you just take time to learn it. Compared to other kinds and types of food prep materials and tools, this one is a lot easier because it is just like sharpening a pencil but except that you are using a spiral kitchen tool that can make spiral noodles out of your vegetables – it’s that simple and easy and ideal you are out of time with food prep. 9) It can help you to save up on food prep time overall. Like we said above, the simplicity of the operation of this kind of food prep and kitchen tool can greatly reduce your kitchen time so that you can have more time doing other things such as cleaning the house or entertaining your guests or even playing with your kids. Cooking can be a lot of effort as well as time consuming so it is more useful. 10) They are usually manually operated so that you don’t really need to spend a lot of electricity on them, unlike juicers and the like. Because of this manual operation, you don’t just save a lot of energy in the long run but you also get some workout with your hands and your sense of balance with your arms. They are a great kitchen tool for raw and sometimes cooked veggie noodles. Q: Why are veggie noodles great to try into spiralizing? 1) Zucchini – also known as “zoodles”, you can make them into noodles and they are one of the most popular choice, because they have the least glycemic load or effect onto your blood sugar levels. They can be a great alternative for wheat pasta or noodles. 2) Turnip – they can also be a great way to spice up your dinner table. Simply pop the turnip into the noodle making machine and you are ready to serve something with a nice name – “toodles”. 3) Carrot – they are also a popular choice with making veggie noodles and they are often called “coodles” so they sound like the word “cuddle”. They can be great for those who love carrots but want to put a twist onto their veggie. 4) Squash – yes, you can also make noodles out of squash, since they are hard enough if they are raw. Squash can turn into “squoodles” and can be a great way to prepare for the Halloween or for Thanksgiving dinners along with your roast turkey. 5) Broccoli – they are much like zucchini such that they can turn into noodles as well. They can be converted into “boodles” and tend to have a more wavy pattern compared to the turnip and carrot ones. 6) Parsnip – the funny thing about this one is that when you turn it into veggie noodles, it sounds like a dog breed – “poodles”. Parsnip is another great veggie that you can substitute for wheat pasta. 7) Sweet Potato – yes, you can also use sweet potato as an alternative to regular pasta or even to regular potatoes. They are basically called “swoodles”. Q: How many carbs can I get from each of these and what vitamins can I get from them? Q: Why should everyone eat veggies? 1) It helps to give you a healthy and glowing skin to look younger and fresh. 2) Veggies can help you fill up lutein for healthy eyesight, especially carrots. 3) It also helps you become more attractive and become more blooming to your partner. 4) Your immune system will get a good boost due to the healthy juices from the veggies. 5) For those with risks of getting diabetes or high blood sugar levels, veggies are great for your diet. Q: What recipes can I try with the spiral machine? a) Zucchini noodles, which uses shrimp that is Cajun seasoned as well as avocado pesto for added health benefits and a fresh green look or presentation. b) Squash lasagna noodles can be made with broccolini that may have a garlic like taste. It is very low on carbohydrates and can be served along with bread for a nice breakfast or lunch. c) Sweet potato noodles can be combined with spinach so you can add more veggies to your meal. You can also put mushrooms in this recipe and make it into a carbonara. d) Spaghetti squash can also be paired with garlic shrimp as well as spinach, kale, collards or cilantro to make into a healthy dish. e) Pad Thai can be made with summer squash noodles as well as zucchini noodles. You can also add peanuts on the side, shrimp, chicken or tofu. f) A bowl filled with spaghetti squash noodle alongside pork, lemongrass and peanut sauce can make for a nice Asian-themed meal that is healthy. Adding coconut milk gives it a more tropical taste. g) Zucchini noodles made into Vietnamese style noodles can come with other spiralized veggies such as carrots and onions. You can add tofu, shrimp, scallops or whichever you like. Q: How do I operate the spiral machine? 1) Pick and prepare your vegetable. You can choose from a wide range of veggies that we mentioned above, such as zucchini or carrots, depending on what is available or what you want to make. 2) Cut off the edges or ends of the vegetable like you would in chopping or peeling it manually. This is to ensure that the hard part does not get stuck or ruined in the spiral machine. 3) Set up the spiral machine and put the blade that you want in it. Follow the user instructions when it comes down to setting up the spiral tool so that you don’t get hurt. 4) Place the veggie into the spiral machine as indicated and then crank the handle. Turn it until all of the veggie parts have been turned into noodles. 5) Simply prepare your veggie noodles normally, in the way you would want to prepare them, especially if you are following a specific recipe. Most of these veggie noodles don’t need too much cooking, since they are made of vegetables, after all. Q: How do I get good results with spiralizing veggies? 1) Know if they will be cooked or served raw. Different food items and vegetables can have different benefits and these benefits will sometimes be better when cooked, but some will be better off when raw. To conclude, it really depends on what you will want to prepare as to whether you want to cook it or not. For instance, broccoli is better raw but carrots and tomatoes are better cooked. 2) Store them properly as much as possible. Not storing properly your vegetable items can make them look worse when you spiral them into your kitchen tool. They can also turn brown if you don’t store them properly, so make sure you buy them fresh and prepare them as quickly as possible right after you buy them. a) They are best used with the slicing blade. b) They can be used for stir frying. c) You can also make them into a slaw or salad. d) You can combine them with coconut oil and garlic. a) They are best with lemon juice as a tossed salad. b) They can be great with making coleslaw. a) The noodle blade should be thicker. b) They are ideal for making curly fries. c) You should use minimal amounts of oil for it. a) You can make it into thin noodles for spaghetti. b) They should be boiled only about 20 seconds. c) You can add some prawns or shrimps. d) They can also be added with Bolognese or pesto. a) They are mostly made for pad Thai making. b) You can also make various Asian dishes with it. Q: Are there ways to make veggie noodles without a spiral kitchen tool? You can use this to just peel off the vegetable in a similar fashion and manner as pasta or noodles so you can make them into healthy veggie noodles in an instant. While this can be a dangerous thing, in some cases, you may be skilled enough even it does consume some more time. It basically involves having to slice the veggie into strips over and over again into noodles. If you do not have a julienne peeler then you can go for a regular peeler to make the noodles, although they can be a little bit thicker than what you’d intend them to be. Q: How do you make your veggie noodles less watery? 1. Use paper towels and lay them flat on a clean sheet of soft towel in the kitchen on a flat surface. 2. Put your veggie noodles onto the paper towels evenly. 3. Lightly salt the whole batch of veggie noodles. 4. Add one more layer of paper towels over the whole batch. 5. Wait for 10 to 15 minutes until all of the moisture has been absorbed. 6. Change the top layer and then roll them out for later cooking. Q: How do you drain your veggie noodles? 1. Using a colander, put your vegetable and arrange it in an evenly manner. 2. Add some salt to make the moisture come out and dry easier. 3. Wait for about 20 minutes and then rinse with cold water to take off the salt. Q: How do you clean this spiral tool? 1) Look for the user’s manual to see if it is dishwasher-safe. 2) Take apart its parts so that each part will be easier to clean. 3) The blades should be washed separately. 4) If you want to prolong the life of your kitchen tool, hand washing is a better option. 5) Using a toothbrush that is no longer in use can make it easy to clean and scrub for food residue. Q: Aside from the spiraling function, what else other functions may be present in this kind of spiraling tool for the kitchen? Q: What are the differences between a spiral machine and a mandolin slicer? Q: Is it dangerous to use this kind of kitchen tool? A: Not really, as the housing of the spiral tool tends to protect it from getting the blades exposed, so that the user will be kept safe from the slicing blades. With the right usage, they are mostly ideal for beginners who may otherwise not be that good at handling kitchen tools. In addition to that, there is a stabilizing and twisting tool that may be present in some models, causing you to help trim off the last of the vegetable or food item without hurting your fingers at all. Having a safe model and kitchen tool is highly crucial for any person, especially if the person is not very used to preparing stuff in the kitchen. Q: What are the different parts that make up this kind of kitchen tool? 1. Blade rack – this one is where the blade sits. 2. Vegetable holder – this is where you put your veggies. 4. Moving platform – this is where the food and the mechanism moves through the machine. 5. Turning handle – you turn this in order to turn and move the vegetable or food item to spiralize it. 6. Housing or body – this is the one that covers all of the important components and parts of your spiral machine to make it last longer. 7. Side handle – this makes it easier for you to handle the machine and keep it as stable as possible. 8. Main handle stand – this is the handle that you hold on to so that you can make the platform and the whole housing sturdier and much more stable. Q: Why is a spiral machine still better than a julienne peeler? A: The reason why the peeler is not that good when it comes down to make veggie noodles is that it can be slower to use and it may also make some room for error as well as potential injury if you do not know how to use it properly and safely. If you are going for really tough jobs in food prep for your veggie noodles then the spiral machine is always the better winner. Q: How do you operate a spiral machine if it is one-handed in design? 1. Choose your preferred vegetable and make sure it’s fresh. 2. Cut it in half if it is not naturally straight. 3. Cut off the top or bottom and make sure the first surface is flat. 4. Push it into the one handed spiral tool and give it a twist. 5. Most of these units have a food holder that you can use for the end of the veggie for safety purposes. Q: Is it possible to spiral red cabbage? 1. Use a regular blade for the task. 2. Make sure that the cabbage is perfectly aligned with the blade. 3. Carefully spiral it as much as possible. Q: What features make a spiral machine safe? 1. Lack of BPA materials for food safety, so that your food will not be contaminated with harsh chemicals that might seep into food and especially vegetables. 2. Use of food grade stainless steel and ABS material, so that your food will be safe from contamination as well as corrosion. It is important that all of the stuff in the unit is of food grade and sanitary. 3. Suction feet for a non skid performance, so that the machine will not easily topple over when you are using it for your food items. 4. Easy to hold handle for safety, so that it will add to the stability of the whole kitchen tool while you are spiralizing your food items. 5. Encasing for the blade compartment, so that it will protect your fingers from getting into the blade and prevent injuries in the long run. This is important so that your operation will be safer. 6. Durable housing to keep the parts intact, so that it will hold all of the parts together without question and so that you will not worry about the parts being disorganized and out of control. 7. Ease of assembly and disassembly for cleaning and safety purposes, so that it will be a lot easier to clean up and to maintain in the long run. It should also be dishwasher safe on some of its components. Q: Is it possible to spiralize eggplant? A: Yes, eggplant is a possible veggie noodle choice. While it may not be as solid as other types of food, there is a possibility to make vegetable noodles out of it. You can experiment with the blades that you have, as to which one suits your eggplant the best, since it may not be as hard as zucchini. 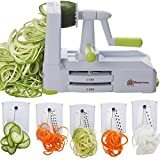 In the long run, we think that the Spiralizer 5-Blade is our pick for the best spiralizer because of its assortment of quality stainless steel blades that accompany various diet plans and its good recipe book for reference on various dishes.